To Rent or Buy - Which One is Best for Me? Are you financially able to buy? Perhaps the most important question to consider is if you are currently financially able to buy a home. Calculate your current monthly expenses, debt and bill payments, and priorities (such as vacationing and retirement funds). Then, consider how much you currently pay on housing every month and see if you are able to pay a mortgage instead, without losing money in the process. If you are currently financially stable and you are able to stay that way if you buy a home, then buying may be a practical decision for you. But if buying a home would negatively impact your finances, it could be something to reconsider. Are you looking to live there long term? Another question to ask yourself is whether you are looking for a long-term home. Do you see yourself living in the same home for five years or more? Is long-term housing what you are looking for, or is there another reason why buying a home is appealing to you? Analyzing your reasons behind wanting to rent or buy may help you decide whether a long-term housing option is the best for you. How is the housing market today? Your experience buying a home can vary depending on the current state of the housing market. If you purchase a home at the wrong time, you may end up losing money when you decide to sell the home later on. Do some research to figure out the state of the housing market and consult a realtor who can help you decide when the optimal buying time would be for you. Is a mortgage cheaper than renting? 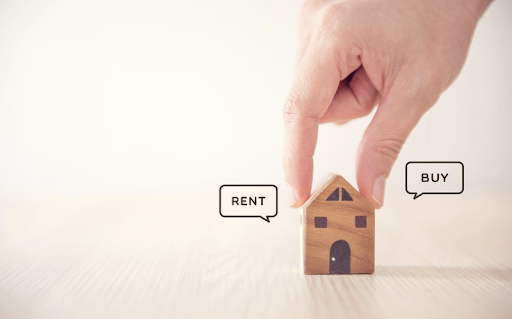 Just as you need to consider your financial capabilities when looking to buy or rent, you also need to figure out whether a mortgage is less expensive than renting. You could be considering the purchase of a home with a mortgage far less than what you are currently paying in rent. If that is the case, buying may be the best option for you, both now and in the long run. However, if you find out that your rent would be far less expensive than your mortgage payments, buying may not be the best financial decision. Are you looking for ease or stability? Are you someone who likes to move easily, or do you like the stability of owning a home? Buying and renting each present their benefits and it is important to compare them with what your current priorities are. If you like the idea of being able to move quickly and not feeling obligated to stay in one place, for an extended period of time, renting may be the best lifestyle choice for you. If you are someone who likes the stability of owning a home and the permanence of living in one place for many years, buying could be up your alley. Consider what you value in a living situation and compare that to the costs and benefits of renting and buying. No matter what stage you are in the moving process, consider these questions before you decide whether renting or buying is right for you.